International Trade Fair of Electrotechnics, Electronics, Automation and Communication Technologies. 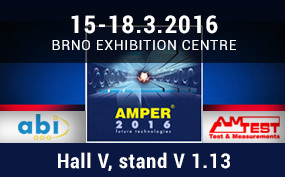 Amper is one of the largest trade events for electrotechnics and electronics in Europe. The leading companies in the electrical sector take part in order to offer their product range to a broad audience - including products and solutions from the fields of electrical engineering, automation, facility technology, communications and wireless technology. AMTEST-TM is ABI Electronics distributor in Czech Republic and they'll be exhibiting the full range of ABI products. In case you are visiting the exhibition and you are willing to arrange a meeting with our distributor, please contact ABI for more information.